baqutayan, S., Abd Ghafar, S., Gul, M. (2017). The Relationship between Stress and Emotional Intelligence among Postgraduate Students: The Case Study at Perdana School, University Technology Malaysia. International Journal of Behavioral Sciences, 11(2), 74-81.
shadiya baqutayan; Siti Wahidah Abd Ghafar; Mah Gul. "The Relationship between Stress and Emotional Intelligence among Postgraduate Students: The Case Study at Perdana School, University Technology Malaysia". International Journal of Behavioral Sciences, 11, 2, 2017, 74-81.
baqutayan, S., Abd Ghafar, S., Gul, M. (2017). 'The Relationship between Stress and Emotional Intelligence among Postgraduate Students: The Case Study at Perdana School, University Technology Malaysia', International Journal of Behavioral Sciences, 11(2), pp. 74-81.
baqutayan, S., Abd Ghafar, S., Gul, M. The Relationship between Stress and Emotional Intelligence among Postgraduate Students: The Case Study at Perdana School, University Technology Malaysia. International Journal of Behavioral Sciences, 2017; 11(2): 74-81. Students facing one stress typically face multiple risky educational circumstances that threaten an array of their study outcomes. Experiencing multiple academic stress can intensify the negative effects that such disorders has on the whole person’s physical, psychological, emotional, and cognitive development. This paper is a survey study, and it discusses the effect of academic stress and emotional intelligence on students’ psychological and emotional well-being. The purpose is to understand the relationship between stress and emotional intelligence among postgraduate students. The data has been collected through online survey that was sent through emails and links on WhatsApp and social networking sites. The accumulated data were then analyzed, and descriptive statistics as well as correlation study were used to interpret and evaluate the respondents’ background, academic stress, and emotional intelligence. The key finding of this research is that stress and emotional intelligence are important; both have effects on the physical and mental wellbeing of postgraduate students. Indeed, there is academic stress among postgraduate students of Perdana School caused by academic workload, performance pressure, self- esteem, time management skills, and study-personal life balancing. Consequently students use emotional intelligence as a coping mechanism to manage stress. Hence, it is highly advisable for the dean of the school, lecturers, and supervisors to look comprehensively at this matter and tackle the consequences of this issue by emphasizing more on students’ wellbeing so they can graduate on time and enjoy the study life. J. K. Schwind, E. McCay, Beanlands, H., , L. Schindel Martin, J. Martin & M. Binder, 2017, Mindfulness practice as a teaching-learning strategy in higher education: A qualitative exploratory pilot study. Journal of Nurse Education Today, 50, 92â96. D. M. Horne, 2017, Emotional intelligence as the precitor of student success in first-year master of social work students. Dissertation. AZUSA Pacific University. V. B. Waghachavare, G. B. Dhumale, Y. R. Kadam &, A. D. Gore, 2013, A study of stress among students of professional colleges from an urban area in India. Sultan Qaboos University Medical Journal, 13(3), 422â429. M. J. Ickes, J. Brown, B. Reeves & P. M. D. Zephyr, 2015, Differences between Undergraduate and Graduate Students in Stress and Coping Strategies. California Journal of Health Promotion, 13(1), 13â25. B.M. Zaid, 2013, Academic Stress Among Undergraduate Students: the Case of Education Faculty At King Saud University. 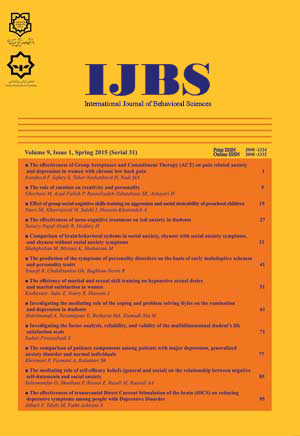 International Interdisciplinary Journal of Education, 2(1), 82â88. B. Sharma, S. Prasad, R. Pandey, J. Singh, K. S. Sodhi & D. Wadhwa, 2013, Evaluation of Stress Among Post-graduate Medical and Dental Students: A pilot study. Journal of Delhi Psychiatry, 16(2), 312â316. A. Goel & S. Bardhan, 2016, Effect of stress on self-efficacy and emotional intelligence among college students of humanities and sciencesâ¯: A study on gender differences, 2(12), 318â328. U. P. Quest, A. I. Commons, P. Openings, L. P. House, H. Sciences and C. Ying, 2013, Role of Emotional Intelligence in Managing Stress and Anxiety at workplace. Journal of the Indian Academy of Applied Psychology, 4(1), 93â102. G. Friedman, 2014, Student stress, burnout and engagement. Dissertation, (1), 1â119. K. V. Keefer, J. D. Parker & L. M. Wood, 2012, Trait Emotional Intelligence and University Graduation Outcomes: Using Latent Profile Analysis to Identify Students at Risk for Degree Noncompletion. Journal of Psychoeducational Assessment, 30(4), 402â413. D.Mayer, R. Caruso & S. P. David, 2000, Emotional Intelligence Meets Tradational Standards for an Intelligence. Elsevier Science Inc.
Z. Hanafi, 2016, Relationship between Emotional Intelligence and Academic Achievement in Emerging Adultsâ¯: A Systematic Review, 6(6). J. de Carvalho & A. D. Colvin, 2015, Emotional Intelligence and Academic Success among Low Income College Students, 2(3), 35â42. N. S. Schuette, J. M. Malouff, L. E. Hall, D. J. Haggerty, J. T. Cooper, C. J. Golden, & L. Dornheim, 1998, Development and validation of a measure of emotional intelligence. Personality and Individual Differences, 25(2), 167â177. Y. Y. Mo, 2010, Measuring and enhancing the emotional intelligence of built environment students, 2(1), 110â129. M. A. Mohzan, N. Hassan & N. A. Halil, 2013, The Influence of emotional intelligence on academic achievement. Journal of Procedia - Social and Behavioral Sciences, 90, 303â312. D. P. Gazder, A. Ali, D. F. Naqvi, N. Zehra, I. Memon & A. Rafay, 2014, Recognition of stressors in postgraduate students of a teaching University in Pakistan. Journal of Education in Medicine 6(4), 40â47.